Spring might be on the way, but winter has not yet disappeared. This is the second morning of snow. Wet. Heavy. It's not sticking much and I expect that this snowfall, like yesterday's, will melt away by mid-afternoon. 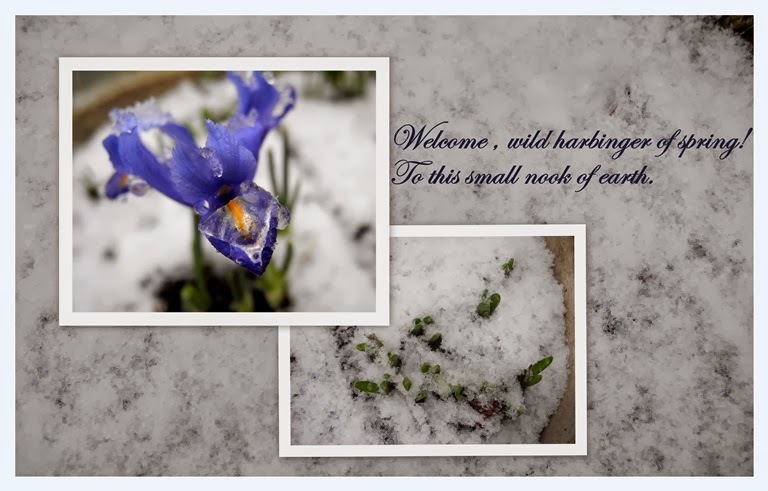 Poor little Dwarf Iris shivering in the snow. Still, a reminder that indomitable spring is lurking around the corner. A good day to drink tea and stare out the window at the falling snow. Or read a book. Or embroider. Or....what's your preferred snowy day activity? Rats about that snow business. But oh joy, oh bliss...there is hints for hope. Poor things, having to push through the snow. I like to read with a mug of tea beside me and the dog on my lap on snowy days. Ours has stuck and is still sticking although it's about as wet and heavy as it can be without falling as rain. The crocuses are all hidden again, and my worry is for all the trees and shrubs that may break under the weight of the snow. Meanwhile, I'm knitting, playing with my camera, sketching, even got my watercolours out. . . I hope it will all get rained away tonight, but meanwhile, I'm enjoying the view from inside. . .
What a change from one day to the next. I love your pale mauve crocus. The poor iris is having a brief struggle but will survive. It's -18 and sunny in Calgary this afternoon. We got to Lake Louise yesterday! It was gorgeous and I'm so glad we went. The ice castle was still there too! Have a great week. Very pretty photo. We have enjoyed a partly cloudy day in GA with a high temp of 70. We sure have had lots of rain and of course, recent snow which is rare. I love hot tea or coffee and a good book on a cold day! Lovely flower, had a shock. I love to read, surf the net or watch old movies. Wishing you a happy week ahead! We have over 8 inches of snow down in Bellingham now - and it is still falling fast. It hasn't stopped for one minute today. Any brave little flowers are covered in snow. They say it will be gone by tomorrow or Tuesday so we are not going to be snowbound. I made a big pot of stew in the crock pot this morning - and on snowy days I like to read, drink tea and eat homemade bread toast with homemade apple butter on it and crochet or hand stitch. This seems to be the perfect day for it. We got a little snow (nothing sticking) yesterday and haven't gotten any today. Saw your pretty sunlit photo and this is a bit different! Have a good week. Dear little iris...hope that you may have rescued her??? My snowy day activity is now going out to "the luge" proving that grandsons are good for an old woman. And I am almost giddy to think that the temps will be much colder and so the snow will last for a while longer. My grands are thrilled! Oh I love the little iris, Lorrie! The purple and yellow are so pretty against the white snow! I've been looking for crocuses around here but haven't spotted any so far. We have had the most gorgeous, spring-like weekend, but they are predicting a possibility of more snow. Sigh. Visiting from Mosaic Monday -- have a wonderful week! How nice to see those signs of spring. We won't see it here for a while yet. Oh that sweet little Iris popping in to see you with a wish "Welcome to Spring"!!! Don't give up hope Lorrie, it will arrive very soon! The poor little purple thing. We are expecting more snow today...I hope it doesn't come. You are finally getting some snow? If I remember you haven't had much if any. Sort of a spring snow! Such a pretty little iris poking out from the snow. It is a good sign of spring on the way. Tea and a good book are definitely my perfect winter day activity. Beautiful snow, but the flowers come anyway - slowly and with delight. Wow, you are getting quite a lot of snow - enjoy the quiet and clean look while you can. I just stared out the windows here when it snowed 2 weeks ago - with my camera at the ready, and plenty of warming drinks of course! Oh it has to be just right around the corner. The lovely iris says so. Spring is springing in the most lovely way there in your garden! A beautiful sight! Beautiful little iris! These first blooms of spring always seem so very special. Hot tea sounds so good right now--I think I will soon stop and enjoy some myself. Stay warm up there to my north! We have had a good covering of snow too and the daffodil greens peeking out last week are no where in sight this week....today the sun is brilliant and the snow will soon melt and springs promise will again show her face. I've been watching photography-related training videos for the past two months, LOL. The time has flown by.